In Lebanon, 26% of working women earn less than $300 monthly and 61% earn less than $500 monthly. There are distinct regional differences in earnings and labor force participation by governorates (mouhafazat). 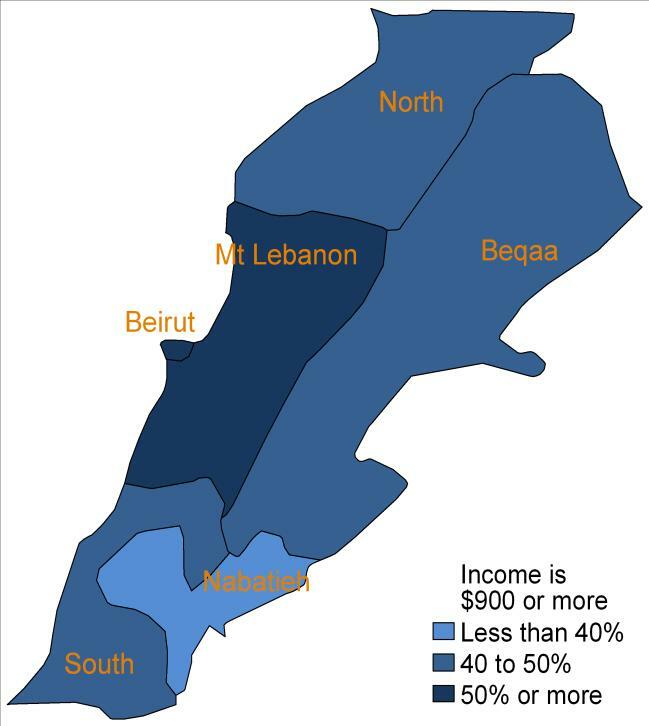 More than 40% of women residing in Beirut, the North and Beqaa work for pay. However, less than 25% of women living in the South work for pay. Even when comparing only full-time workers, there is a significant wage gap between male and female workers in Lebanon (Figure 9). Three times as many men as women earn more than $1101 per month and three times as many women as men earn less than $300 each month. Of working women, 61% earn less than $500 per month, while half that number of working men earns such low wages. Forty-five percent of men earn over $700 per month, compared to just 22% of women. Women and men working in the public sector earn similar wages, but women working in the private sector earn substantially less than their male counterparts. This is no small problem, as 86% of all workers are employed in the private sector (Figure 10). In the public sector, women are actually slightly more likely than men to earn over $700 per month (51% versus men’s 47%). This contrasts starkly with the private sector, where 46% of male employees earn over $700 a month, in comparison to 20% of women. Not surprisingly, younger women are also more likely to earn lower wages than their older counterparts. As wages often increase with experience, those who have been in the labor force longer can typically expect to earn higher wages. Among working Lebanese women ages 18 through 25, two in three earn $500 or less monthly. Among those 36 to 55, a slight majority earns over $500 per month (Figure 11). Education increases earning power: among working women with a university degree, 49% earn more than $700 per month. Among those who have completed secondary school, only 21% earn that much. Among those with a complementary school education or less, more than three quarters earn $500 per month or less.